Buying followers have become quite usual in today’s social media landscape. Today, there are more services than ever that sell fake followers at a shockingly low price. You can buy Instagram followers, Twitter followers, Facebook likes, and so on. You can virtually buy fake followers across all social platforms. Gaining traction on social media can be hard without the right strategy, and unfortunately, that’s why people and brands turn to fake followers to boost their numbers and fake their popularity. Today, there are billions of social media accounts, which means the competition is tougher than ever. If you’re going to succeed, you need to focus on relations and content, however, there are people and brands looking to take shortcuts – by buying fake followers. If you’re looking at your competitors and wonder how the heck they can outrun you so quickly and leave you in the dust, you might want to think again. On social media, everything isn’t as it seems when it comes to numbers. People are buying fake followers more than ever, and that’s an important thing to factor in when you’re comparing yourself to your competitors. Don’t get fooled by the huge numbers some people have because it might be made up of fake followers, in other words, a bot who you won’t benefit in any way from. Maybe, you’re contemplating about buying fake followers yourself? But let me ask you, do you prefer 1000 highly loyal and targeted followers who care about your posts and page, or do you prefer 10,000 followers who are all bots and never interact with your posts? All social media platforms are different, however, the principle of spotting if they are buying fake followers or not is pretty much the same. This means that with the help of these tactics, you’ll be able to see if someone is buying fake followers on Twitter, Instagram, Facebook, and more. An easy tell that someone has bought fake followers is the accounts that are following them. When you buy fake followers, you get fake profiles (bots) to follow you. Some argue that you can buy “real” followers, however, I am still waiting for proof. As a result of the fake followers, you can just take a look at the profiles of the people who are following them. Since they are bots, they usually have none or a very strange profile image – sometimes it can be a “cute selfie”. Normally, their bio description isn’t completed, however, if it is, it’s usually very strange and definitely not something that a real person would write. Moreover, these profiles often have no or very few posts, and if they do have posts, they are very weird, and the caption of the posts is even stranger. Fake profiles often also have information and links to “earning more” that can indicate fake followers. Moreover, fake followers usually also follow thousands of users (because they’re paid to follow accounts and that’s what their account was made for). If you see that they have a sudden spike in followers (and likes), there’s a huge chance that they bought followers. Sure, if they partner with an influencer or get press coverage, you can get a sudden spike in followers, however, if that happens, you’ll probably know. Sudden spikes are one of the easiest ways to see if someone has bought fake followers, and the best part is that you can see exactly when they bought them. 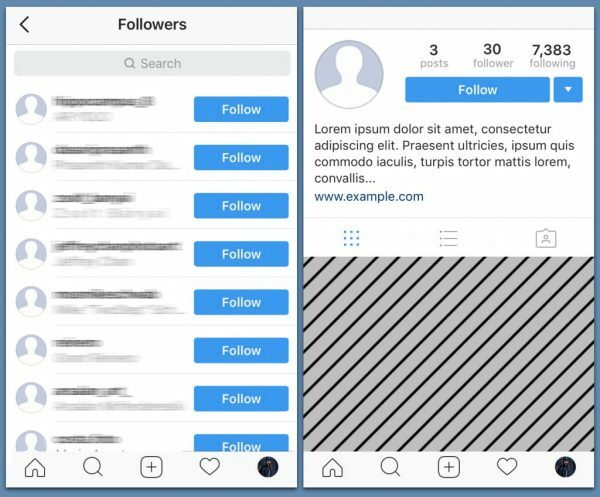 What’s more, you can also see how they will slowly but surely lose followers as the fake accounts that followed them are getting banned one by one by Instagram. With the help of Social blade, you can look at how their follower count has changed. There, you can look at Twitter accounts, Facebook accounts, Instagram accounts, Twitch, and YouTube. Just take a look at the change in followers on this Instagram account. Because I genuinely feel sorry for the person’s desperateness. But I am sure that you agree with me when I say that there is something very off about that graph. From 430K followers to 863K followers in one day! (and then 850K to 1.4M a few days later). Yeah right! Not even Instagram themselves, the largest account on the platform grows that much per day. The people who buy fake followers often receive a lot of spam comments on the posts they share. The good news is that spam comments usually can be spotted from a mile away. However, you should also remember that not all accounts that have spam comments on their posts have bought fake followers. Sometimes, they might have bought only comments, and other times, it can be spammers that are just leaving their spam everywhere. An easy way to identify fake followers is by using tools. 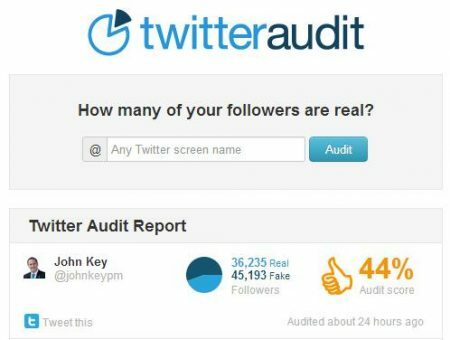 Twitter Audit allows you to check any Twitter account and see how many fake followers they have. In a few seconds, you can see an estimate of how many fake versus real followers they have as well as see their audit score. Using tools allow you to get deep insights into people’s followings to understand if they are buying fake followers, without having to do any detective work. What is the result of pumping up your follower count with fake followers? You’ll get a drastic increase in followers but your engagement rate will remain stuck at whatever rate it was before. It means that a low engagement rate can indicate purchased followers, however, have in mind that it doesn’t have to. You should be careful with witch hunting by simply only looking at their engagement. To draw the conclusion that they’ve bought fake followers by looking at their engagement, you should back it up with some other studies, for example by using SocialBlade. When you see a clear disparity in engagement, something is not adding up. When you have lots of followers, they should be engaged in what you do, leave thoughtful comments, and like your posts, however, if they don’t, it might be a sign of fake followers. This doesn’t tell us a lot, you may think, but the main reason that people follow an account is because of their content. If people find it interesting and appealing, they’re much more likely to follow. Of course, we have exceptions with celebrities and such, where people follow them because they are them, and not because of the content they share, however, for the rest of us, we have our content to rely on. The number one reason people decide to follow someone is that they want to see the content they are sharing. If they have accumulated lots of followers, but they are sharing boring content that you wouldn’t even want your worst enemy to watch, why would the many thousands of followers want that too? Ask yourself, are they ¨SHRING anything interest in their feed? If not, why would you or the thousands of people who are – want to follow them?